Wherever in the world we operate, we’re passionate about giving back and working with our local communities. Last year, we raised more than £2.5 million for charities and good causes globally. Raised £1.3 million for various causes including Guide Dogs for the Blind, Blind Veterans UK, Vision Aid Overseas, Hearing Dogs for Deaf People, Sound Seekers and many more. This was thanks to the combined efforts of the stores, support offices and personal donations from Dame Mary and Doug Perkins. Through our marketing and PR activity we supported National Eye Health Week by raising awareness of eye health and the importance of regular eye examinations. We embarked on a new partnership with the Royal National Institute of Blind People (RNIB) commissioning a State of the Nation Eye Health Report and pledged to raise £100,000 to help fund sight-loss advisors around the UK. Through our annual Spectacle Wearer of the Year (SWOTY) competition we raised £88,000 for UK anti-bullying charity Kidscape. Our Irish stores continued to support the renovation of an ophthalmic unit at Our Lady’s Children’s Hospital in Crumlin, adding a further €50,000 to the €100,000 already donated. At the Specsavers Partnership Seminar in Australia, we raised $125,400 for CanTeen, a young people’s cancer charity that provides counselling and support to those aged between 12 and 25. 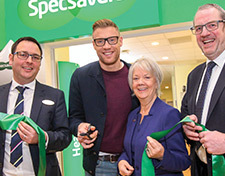 Our stores provide employment for more than 27,000 local people, all of whom have access to regular training and development, helping them to progress through Specsavers on their chosen career path. The same is true for the 4,000 people who are employed in our support offices and manufacturing and distribution sites around the world.